There may have been other "retro" rock acts before him, but Lenny Kravitz was one of the first to not be pigeonholed to a single style as he's touched upon such genres as soul, funk, reggae, hard rock, psychedelic, folk, and ballads over the years. 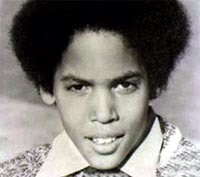 Lenny Kravitz was born in New York the son of Jewish Hollywood producer Sy Kravitz and Bahamian actress Roxie Roker (of The Jeffersons), Lenny grew up in wealth. 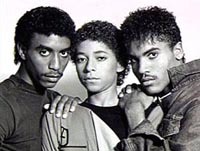 His parents moved to California Having taught himself bass, piano, guitar, and drums at an early age and developed his singing voice in the California Boys Choir and the Metropolitan Opera, he attended Beverly Hills High School and performed under the artist name, Romeo Blue (see picture). At that stage, he was heavily influenced by Prince. His parents were friends with jazz greats Duke Ellington, Sarah Vaughan, Count Basie, Ella Fizgerald, Bobby Short and Miles Davis so he grew up in a musical household although he would pursue a career in rock rather than jazz. In the late 1980's, Kravitz returned to New York to pursue a musical career. He ended sharing a house with Lisa Bonet who played Denise Huxtable on The Cosby Show. The two would fall in love and would marry. In New York, Kravitz would broaden his influences beyond Prince to classic rock and soul artists such as Hendrix, the Beatles, Led Zeppelin, Stevie Wonder, Curtis Mayfield and Bob Marley. He signed a contract with Virgin Records. His 1989 debut album Let Love Rule was a moderate success, reaching #61 on the Billboard album charts. "Let Love Rule" the title track would reach #89 on the Billboard Hot 100 and #5 on the modern rock charts. "I Build This Garden" the second single reached #25 on the modern rock charts. Kravitz gined greater recognition when Madonna reached number one with a cover version of his song, "Justify My Love" on her Immaculate Collection album of 1990. 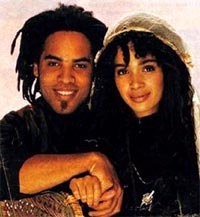 Kravitz's marriage to Lisa Bonet would end in the same year. "It Ain't Over Til It's Over", which reached #2 on the charts and #10 on the Billboard R&B charts. "Always On The Run" featured Slash of Guns n' Roses and reached #8 on the modern rock charts and #40 on the mainstream rock charts. while "What Comes Around Goes Around" reached the top 40 of the Billboard R&B chart. The album would also feature a contribution by Sean Lennon which was Lennon's first appearance on record. "Heaven Help/Spinning Around Over You" reached #80 on the Billboard Hot 100 and "Heaven Help" reached #92 on the Billboard Hot 100. Kravitz covered the Kiss song "Deuce" for a tribute album, with the track reaching #15 on the Billboard mainstream rock chart. "Rock And Roll Is Dead" reaching #75 on the Billboard Hot 100, #4 on the mainstream rock chart and #10 on the modern rock charts. "Can't Get You Off My Mind" reached #62 on the Billboard chart and #36 on the US adult chart. "Fly Away" would reach #12 on the Billboard Hot 100 in 1999 and #1 on the modern and mainstream charts. His cover version of 70s rockers The Guess Who's hit "American Woman" won him a another Grammy for Best Male Rock Vocal Performance in the Grammy Awards of 2000 and helped The Guess Who find a new audience. The song originally came from the soundtrack of and was added to the 5 album as a bonus track in 1999. The song would reach #49 on the Billboard 100, #3 on the Billboard modern rock chart and #7 on the Billboard mainstream rock chart. Lenny Kravitz would release a 15 track Greatest Hits compilation. It proved to be his most successful album, reaching #2 on the Billboard 200 and Canadian album charts and achieve triple platinum status. The single "Again" reached #4 on the Billboard Hot 100 and #1 on a world adult composite chart (based on the US, UK, Canada, Germany, France and Australia) and US adult chart. The track would also earn him his third consecutive Grammy for the Best Male Rock Vocal in the Grammy Awards of 2001. "Dig In" reached #31 on the Billboard 200 and went top ten in the world adult and US adult charts. It also reached #1 in Argentina, went top 5 in Portugal and top 10 in Italy. "If I Could Fall In Love" reached the US adult top 40. Jay-Z invited Lenny Kravitz to appear on the track "Guns and Roses" on his 2002 . Kravitz would also join P. Diddy, Pharrell Williams and Loon on the track "Show Me Your Soul" from the Bad Boys 2 soundtrack. In 2004, he would appear on a track on N.E.R.D's album Fly or Die. Jay-Z would appear on the track "Storm" on Kravitz's 2004 Baptism album. In early 2003, Kravitz released the track "We Want Peace" as a download-only track as a protest against the 2003 invasion of Iraq. The track reached #1 on the world internet download charts and MP3.com download chart. Kravitz will also be appearing on Unity, the official album of the 2004 Athens Olympics. "Where Are We Running", has reached #69 on the Billboard Hot 100, top 25 on a composite European chart and top 20 on Internet charts, Argentina, Italy and the world and US top 20 as of the end of May 2004.